Which countries spend the most on their military? The US is by far the world's biggest military power. President Trump has announced plans to increase the US defense budget in 2018 by $54 billion dollars in order to "rebuild the depleted military of the United States of America at a time we most need it". Some have said that this figure is misleading and the actual increase is ‘only’ $18 billion. Whatever the final amount, the increase will take the US even further ahead of the rest of the world in terms of outright military spending. 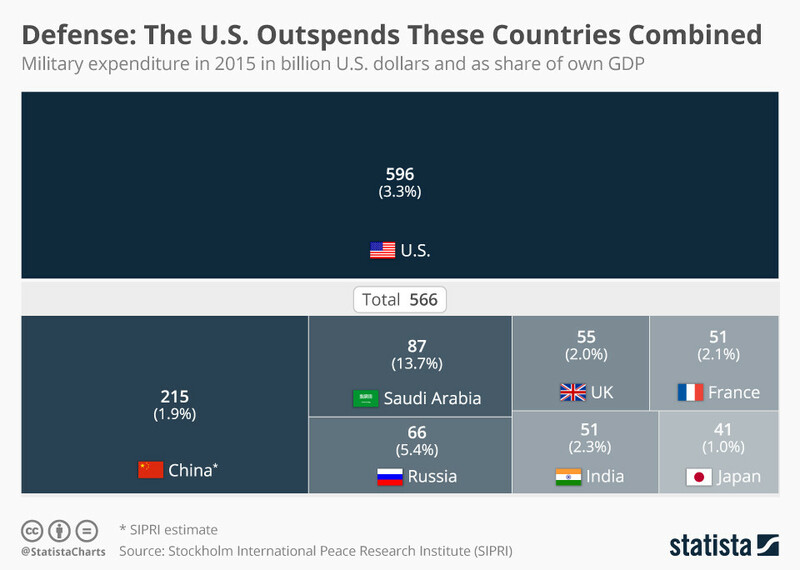 According to the Stockholm International Peace Research Institute, in 2015 US defense spending outstripped that of China, Russia, UK, France, Japan, Saudi Arabia and India combined. When it comes to spending as a share of GDP, the United States' huge output naturally brings it down the rankings. Of the top proportional spenders, Saudi Arabia is way ahead, with 13.7% of GDP. The USA's military superiority lies in its airpower with 13,400 aircraft, four times as many as China and three times more than Russia. Russia has the most tanks by far at 15,000, but China has the most ships with more than 2,000 compared to the American fleet of just 400. However, the US fleet is by far the most advanced with 10 aircraft carriers, the latest USS Gerald R. Ford costing $13 billion and able to launch aircraft much more efficiently with the first electromagnetic launch system. Is the Transatlantic Alliance at a Tipping Point? In the past, President Trump has suggested that NATO members are not spending enough on their own military. Certainly, when it comes to comparing spend, the US dwarfs other members. The chart shows that Washington’s military spending is nearly three times that of all other NATO members combined. As the above chart shows, after the United States, only four other members of NATO currently meet the 2% of GDP target for military spending. Is al Qaeda about to reclaim its role as the world's leading jihadist terror movement?